Do you have to pay back any advance payments of premium assistance? Why: if you were underpaid, additional tax credits could be released to you. If you were overpaid, you pay back the overpaid tax credits. However, the amount you pay back to the IRS might be limited. The premium assistance tax credit is a federal subsidy available for people and families with income less than four times the federal poverty line. The premium assistance tax credit is meant to reimburse people for the cost of health insurance that's purchased individually through an exchange. This credit can be paid in advance. If you received advance payments of the premium assistance tax credit, then you'll need to reconcile your advance payments. Reconciling means comparing the amount of advanced payments that your insurance company received on your behalf from the IRS to the actual amount of the premium assistance tax credit for which you are eligible. The purpose of reconciling is to discover whether the advance payments are more than, equal to, or less than the actual amount of the tax credit. When you enroll in a health insurance plan purchased through a federal or state health insurance exchange, the exchange calculates your premium assistance tax credit based on estimates of your household income for the year. Advance payments are merely an estimate. The actual amount of premium assistance tax credit is calculated using Form 8962 and is based on your income information shown on your 2017 tax return and your health insurance premiums, which are reported on Form 1095-A. Advance payments of the premium assistance tax credit go from the IRS to the health insurance company through the insurance exchange. The advance payments are then applied to your premiums, thereby reducing the amount of premiums you have to pay out of your pocket. The amount of premium assistance tax credit paid in advance might be different than the actual amount of the tax credit for which you are eligible. The IRS may have paid too little in advance, in which case you can receive any additional tax credit. Or the IRS may have paid too much in advance, in which case you pay back the extra amount to the IRS. Or the IRS may have paid out exactly the right amount, in which case you will neither owe money to the IRS nor receive extra tax credits from the IRS. The process of comparing advanced payments with the actual amount of the tax credit is called reconciliation. The process occurs when you prepare your tax return for the year. Individuals will need to reconcile between the amount of advance payments received and the actual amount of the tax credit. Form 1040A or 1040 completed through the end of page 1. Form 8962, Premium Tax Credit. It is a new form developed by the IRS and first used in the year 2017. Form (or Forms) 1095-A, Health Insurance Marketplace Statement. It is another new form developed by the IRS and first used in the year 2017. Form 1095-A is prepared by the health insurance company and is sent to you by January 31. Second, prepare Part 1 of Form 8962. This section of the form calculates the actual amount of the premium assistance tax credit. Next, fill out Part 2 of Form 8962. This section of the form reconciles the advance payments with the actual amount of the premium assistance tax credit. The actual amount of the premium assistance tax credit is found on line 24 of Form 8962. The amount of advance payments is found on line 25 of Form 8962. 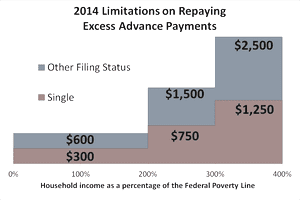 If the actual amount of the premium tax credit is more than the advance payments, the IRS will pay the extra amount. If the actual amount of the premium tax credit is equal to the advance payments, then the amount received in advance was exactly the right amount. There is nothing for you to pay back to the IRS, nor is there additional credits for the IRS to pay to you. The applicable dollar amounts in the table above will be indexed for inflation each year. Sources: Internal Revenue Code section 36B (2014 amounts), Revenue Procedure 2014-61 (2015 amounts, pdf file), Revenue Procedure 2016-53 (2017 amounts, pdf file), and Revenue Procedure 2017-53 (2018 amounts, pdf file).